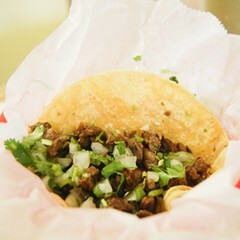 One of two—formerly three—Ashland locations dishing out "the best tacos in town." La Pasadita has had its share of fame: LTH Forum anointed the hole-in-the-wall on the east side of Ashland one of its Great Neighborhood Restaurants, and English celebrity chef Heston Blumenthal and friends once paid a late-night visit to the larger location on the street's west side (at 1132 N. Ashland). (That one has also been featured on Check, Please!) 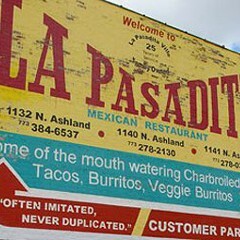 But the truth is, La Pasadita is a local institution, notwithstanding the debate about which outlet is "best." It's also an example of the American dream come true: the patriarch of the Espinoza family that runs La Pasadita opened the first shack in 1976, and expanded across the street when it took off, eventually adding a third location. Specialties include quesadillas nortenas, cheese-stuffed corn tortillas smothered with onions and fresh tomato sauce, and parrillada especial, a tortilla pan heaped with enough chicken, spicy sausage, carne asada, and thinly sliced short ribs to feed a family of four. There are also tostadas, tortas, a couple of stews, and vegetarian items, and aficionados will appreciate the salsa negra.